Camayak Blog | What is Camayak? 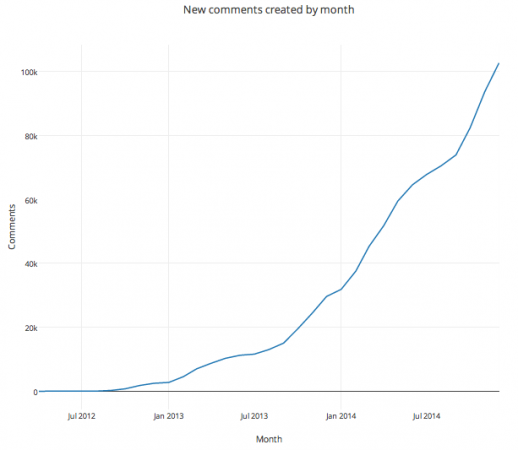 How compulsive is your online newsroom? We’ve always looked to the physical newsroom as the #1 source of wisdom for creating a culture that produces great content. Offline interaction can be quicker and more subtle, especially in editorial. That’s why Camayak newsrooms can now see who’s working on what, in real-time. This is Camayak’s latest move towards allowing teams to expand and thrive beyond their physical space. Want to know who’s working on what right now? Now everyone can see for themselves and help each other move assignments forward. If you’re taking on a new initiative and would like our help evaluating your tools and processes, get in touch and we’ll set up a call. NEW YORK, NY — Today, Camayak is launching a unique partnership with Chartbeat to give campus newsrooms across the country access to better digital analytics. Twelve college newsrooms including the University of Oregon’s Emerald Media Group, Texas Christian University’s TCU360, and California State University, Northridge’s Daily Sundial will begin to use Chartbeat tools to measure the real-time engagement of their online content. As newsrooms across the world embrace the power of smart technology, employing the right metrics and right tools is crucial. For publications looking to produce and distribute the highest quality content, clicks and impressions are unreliable and ineffective metrics. Instead, to write better content, grow loyal audiences, and secure financial sustainability over time, the world’s most influential publishers have turned to time-based metrics. Now, student journalists and editors from these twelve newsrooms will know what content is capturing and keeping their readership’s attention every moment of the day. In addition to their own data, each of these newsrooms will have access to the real-time data of all twelve sites, so that each can see the performance of its peer institutions. Being able to adapt to real-time data will further support teams that are moving from a weekly assignment to a 24-hour news cycle model. As campus newsrooms look to scale their content production to keep up with their online audiences, college newsrooms expect to seize more opportunities to satisfy their students and alumni. “We know that Chartbeat will provide the kind of stats that a newsroom and a sales staff can put to great use”, says Stephen Wolgast, Director of Collegian Media at Kansas State University. If you’re interested in joining the consortium. of college newsrooms sharing their analytics, get in touch with us to schedule your free 30-minute Camayak demo. Not a college newsroom? Check out our professional pricing and let us know if you’d like to try Camayak. Camayak. 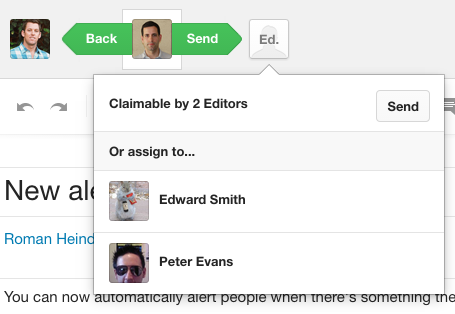 Camayak tracks and publishes every assignment in your newsroom’s workflow. We work with senior editors and managers to define their editorial processes so publishers can grow their contributor numbers without compromising on the quality of their approved assignments. Camayak puts newsrooms in control of their content production. Chartbeat. Chartbeat measures and monetizes attention on the web. It is most well known for the real-time analytics tools that help 80% of the top publishers in the US and 50,000 media sites in over 60 countries develop a defined loyal audience and monetize that audience’s engagement. Chartbeat works with editorial teams to align them around the right audience development goals and with ad sales teams to give them the data they need to adapt when it matters. Chartbeat proves the monetizable value of quality content over clickbait. If you’re managing an editorial agency that works with multiple clients who want their own newsrooms, or freelancing for a variety of publications that use Camayak, we’ve just made it easier to stay on top of all your priorities. Camayak users can now switch effortlessly between the newsrooms they belong to, prompted by the number of unread notifications that they have in each ‘room’. You can belong to as many newsrooms as you like and each one retains its privacy from the others, allowing you to build up teams with limited access to each vertical, group, or publication that you’re managing. For agencies looking to pilot Camayak, you can arrange an introduction webinar by emailing hello@camayak.com. If you’re already using Camayak and want to manage a newsroom account for a different group or publication, get in touch and we’ll walk you through it. We work with plenty of journalists who use primary source material alongside their assignments. Now they can store theses files with their work directly in Camayak, so their colleagues can access them, too. Simply use the media tab and upload the file of your choice to store along with everything else you need to share. It all started with a community college in Torrance, California. “Oh, so you’re not a CMS?” Kate McLaughlin – the adviser to the student media department at El Camino College asked. “I think I get what you’re saying. You’re just workflow, right? That could actually be really helpful”. Soon after El Camino College became our first beta tester in 2011, Steve Wolgast, who had recently joined Kansas State University’s Collegian Media Group from the New York Times, decided we were worth taking seriously and invited us to pitch for helping the ‘Collegian organize itself more efficiently and publish approved stories directly to its new WordPress site. Over a year earlier, our initial plan for building Camayak had emerged out of a sense that we could contribute to a healthier ecosystem of CMS designed specifically for news production. Around the same time, other companies like Burt Herman’s Storify were looking to give journalists better tools for composing their articles, while outsourcing services like Contently were also starting to make workflow a key part of their appeal to clients that were hiring writers through the same interface. For everyone in the news production business, speeding up collaboration was becoming more important for shrinking editorial teams to get the most out of their staff budgets. Today, we’re still working towards our goals of offering better archiving and multi-platform publishing to publishers, regardless of which CMS or social platforms they’re using. Over the last three years, we’ve grown our customer base by eliminating bottlenecks in the processes of pitching, assigning, editing and approving editorial work. People using Camayak have published over 7 million words between them, enjoyed integrations with major media companies like Getty Images and even built their own connections to other services like Slack. Encouragingly, we’ve seen increases in productivity in almost every single newsroom we’ve worked with for at least twelve months. We’ve also connected customers to help one another with advice and, particularly with student newsrooms, have enjoyed compiling data representations to point out quirky trends that their staff have helped to generate. At the moment we have a diverse range of clients, from high schools to PR firms and college media to non-profit news organizations. Because we’ve charged for our service since day one, our reception among newsrooms has focused on our cost-to-benefit ratio. For up to thousands of dollars a year, is Camayak worth its expense? When a CMS and server costs are inescapably necessary for delivering content to its audience (although Facebook and other platforms might challenge this), how does a pre-publishing tool that only the newsroom interacts with stack-up as a budget priority? For most teams that are used to using their free generic tools, plugins and overtime (particularly in the form of student labor), the answer is: not at all. Reporter. First and foremost, logging into your newsroom as a reporter and contributing to its flow of content needs to be seamless and engaging, irrespective of whether you’re a veteran or newbie. Our second goal is to convert the collaboration data we track into meaningful statistics that offer a broader and deeper insight into a reporter’s performance in their newsroom. We do this by offering them a free portfolio of their work and, increasingly, helpful data on their productivity and style. As it stands, few – if any – services can offer insights like Camayak can into a reporter’s actual newsroom performance. Editor. Our objective with editors is to noticeably reduce the amount of confusion and admin tasks that surround the process of tracking editorial progress, week-in, week-out. This equates to a real saving in the amount of time it takes to produce the same amount of work as before Camayak was introduced to the newsroom. 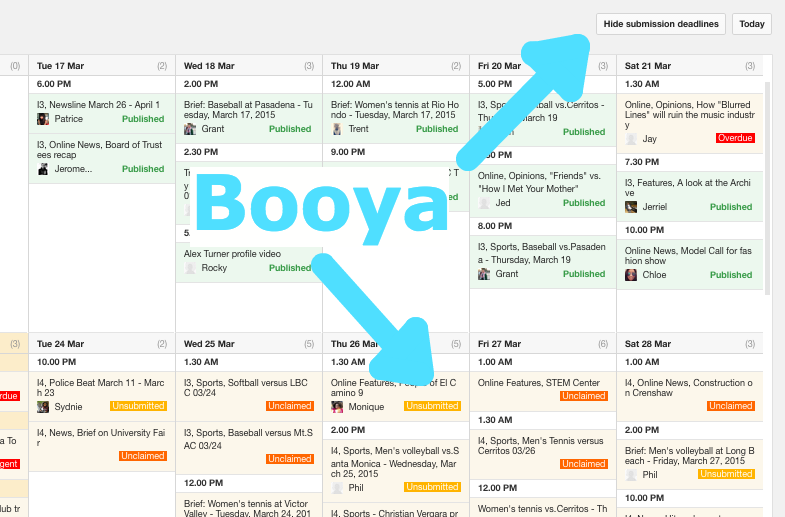 Since all assignments and pitches are tracked through Camayak, editors need a birds-eye view of their editorial calendar, which we have the information to build for them. Editors should find themselves with less micro-managing to do and more opportunity to determine strategy. Administrator. We want to give the people paying the bills the best insights they can get on how their staff are performing. They, like editors, should also be able to piggyback off of their newsroom’s momentum to offer best practice advice where it’s needed most and commend excellent work more easiy. “This is going to cost us money we don’t have”. Two or three years ago I read a report claiming that newsrooms were not unlike a typical Fortune 500 company, in that on average they would devote between 2-4% of their operating budget to IT services that improved their business. To be as competitive as possible, we’re committed to putting downward pressure on our pricing as our client base grows, particularly at the student/education level. “This is just going to be another login for our staff to remember”. When you’re dealing with a high turnover of staff and/or folks that aren’t technically advanced, the fewer interfaces they can be trained on, the better. Camayak replaces Google Drive, Dropbox, server access and even your CMS to offer content producers a single login to all their newsroom collaboration. “We already have a CMS that handles our workflow”. Once you’ve chosen a CMS you can expect to keep investing in the platform to make it move with your changing requirements in the future. Sometimes this investment is so intimidating that it can, often in conjunction with a dissatisfaction towards the platform itself, push you towards wanting to move to a different CMS entirely. Outsourcing workflow to a purpose-built layer like Camayak limits a newsroom’s dependence on their CMS and fundamentally de-couples content production from where it eventually is displayed. As audience engagement platforms proliferate, designing a single CMS with both production and rendering requirements puts priorities at risk. “Everybody has to use it in order for it to work” (aka “can’t some of us use one tool and the rest of us use another?”). One of the main reasons we hear of people choosing to track their editorial workflow with tools like Camayak is to ensure they generate clean audit trails of what they’ve done. By addressing three different sets of user needs (see above) we work to make sure that the main stakeholders in a newsroom can each improve their workflows by using Camayak. While there may be a learning curve that comes with new tool, homogenizing the format of a team’s input reduces the number of repetitive tasks between applications and significantly in the long term allows us to provide consistent performance measuring to editors and administrators. We’re working to build a better product that learns from the lessons we’ve taken from working with so many awesome newsrooms already. If you’re looking for advice on how to manage your editorial calendar, streamline your editorial workflow or scale up your content production, you can find us at hello@camayak.com. We’ve been working on a feature to help newsrooms figure out how to evaluate and pay their staff more efficiently, week-in, week-out. Here’s why. Every fortnight, writers at the Kansas State Collegian fill out their pay sheets so they can show their editors what they worked on. On average, let’s say it takes just 2 minutes for each writer to fill one of these pay sheets out. Each desk editor then checks their writers’ sheets to make sure they’re accurate. On average, this takes each desk editor 10 minutes to do. The person who’s responsible for collecting all these pay sheets then needs to enter each person’s details into a spreadsheet, so it can go into the billing system. This takes them about an hour each fortnight. 30 writers write articles over a two-week period, so 30 people spend 2 minutes each writing their pay sheet (60 minutes in total). Four desk editors take 10 minutes each to check these writer sheets (40 minutes in total). Then an editor needs to summarize the pay sheets so they can be added to the billing system (60 minutes in total). In this case, our goal is to save the newsroom over twelve hours a semester in tracking whom they should pay and how much. In comparison, a newsroom like The Daily Wildcat at the University of Arizona has seven desk editors that spend about 30 minutes each counting their writers’ bylines. That’s a total of over four hours of time that Camayak could save them, every fortnight. At Georgia Southern’s Student Media department, the students are paid through a bi-weekly stipend. Even though they spend less time tracking how many assignments each writer has worked on each week, they can sometimes lose track of a writer falling short of their weekly commitment. A writer stops writing regularly and therefore no longer qualifies for she fortnightly stipend. Since the writer hasn’t officially informed their editors that they’re quitting, payroll doesn’t know that they shouldn’t be paid this week. In this case, Camayak can now save the newsroom from over-paying its contributors, to ensure that it never spends more money than it has to. We exported payroll data for a couple of newsrooms that use Camayak and using the RAW visualization tool, turned their statistics into pretty pictures. The size of the circles refers to how many assignments each staff member completed and/or uploaded files to, between July 2014 and February 2015. The larger the circle, the more assignments they worked on. 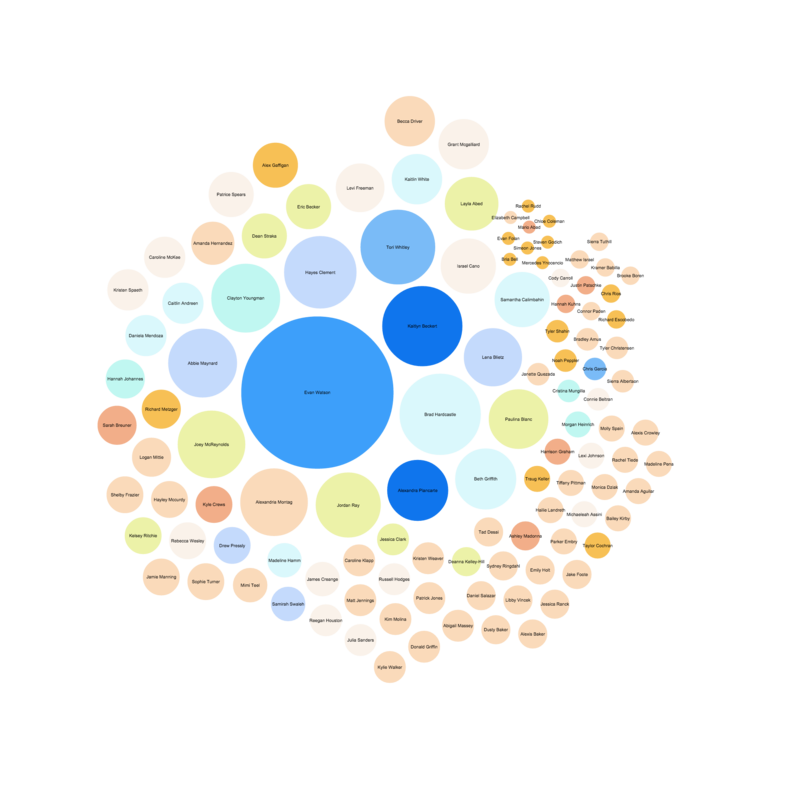 The colors of the circles reference how many files each staff member uploaded to those assignments. The closer to orange, the fewer files they uploaded. The closer to blue, the more they did. 113 staff wrote and/or uploaded files to approved assignments from July 2014 to February 2015. After we launched our daily email roundup, editors asked us to include a reminder to their writers if they had upcoming deadlines. From today, we’ll let your writers know if they have a deadline within the next 24 hours. We’ll even nag them if they miss it. 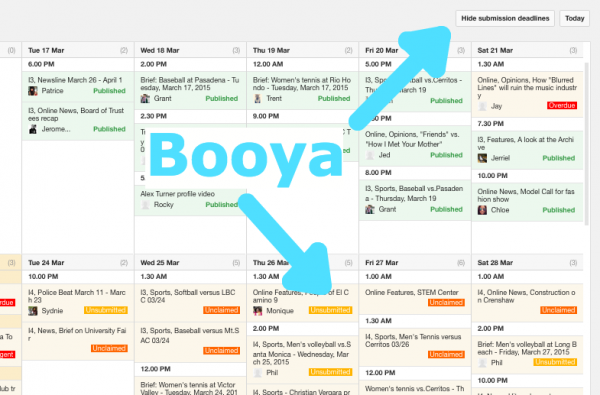 We’ve also changed the way your calendar looks in Camayak so you can see who’s assigned to each item that appears. As well as viewing assignments for a specific desk or publishing destination, you can now also choose to see all your contributors’ first submission deadlines alongside your publishing schedule. This is a plot about four newsrooms using the Camayak platform. We plot various indicators of staff behavior over time. The time dimension is represented in the music as time. The music is composed of verses, each verse corresponding to a season. Each season is broken into four equal parts (approximately 23 days each), and each verse is correspondingly broken into four “phrases”. We distinguish between the summer season and all other seasons in these ways. The commenting on assignments and pitches in newsrooms and assignment of tasks to writers affects the main rhythms and the use of drums. The rhythm for the melody is based on averaged data across all the newsrooms and dates for the particular season. There are two underlying tracks, and the data affect how fast the rhythm; one of them gets faster when more comments are made in the newsrooms, and the other gets faster when more assignments are created. Similarly, the bass drum turns on when there are lots of comments, and the hi-hat turns on when there are lots of assignments. 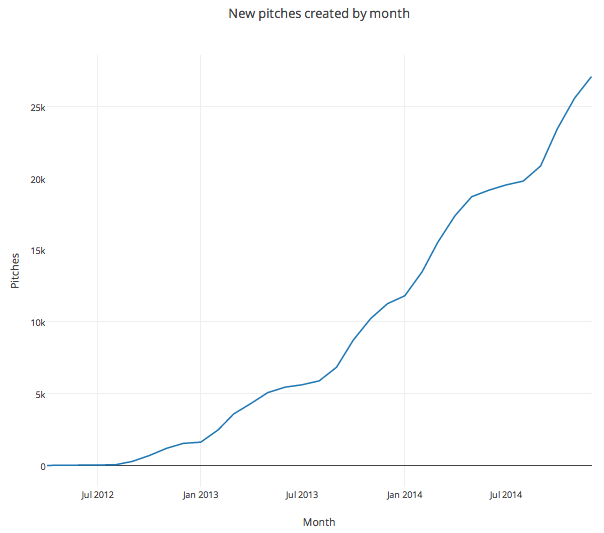 Pitches of all notes are based on the data for the particular newsroom during the particular 23-day section of the particular season; pitches are higher when more assignments were created. The time dimension also is represented in the video, as the x-axis. The season’s name is shown in text, and the background color changes to grey in the Summer. 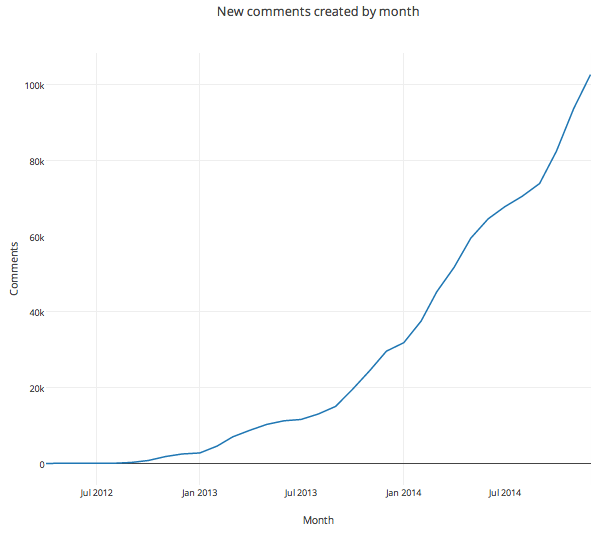 The y-axis in the video is the activity generated per day. Activity per day is plotted incrementally—in 23-day sections and one organization at a time. The name of the present organization is written towards the bottom-left of the screen, and the curve for that organization is shown in front of all of the other curves. At the right end of the curves are plotted an alternating circle and triangle. 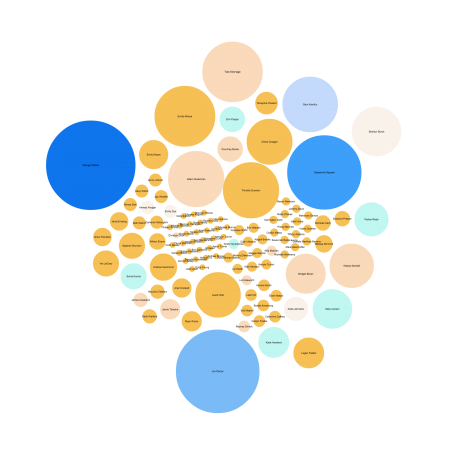 Their size is proportional to the number of pitches submitted (circle) and users registered (triangle) for the particular date. Activity is low during the summers and very low at the beginning and ends of the song. Low activity during the summers occurs because three of the newsrooms are student newsrooms, which have much less activity when school is out. Low activity at the beginning occurs because the newsrooms had not yet begun using Camayak, and low activity occurs at the end because we are using data that were exported a couple months ago. There is a weekly trend of high activity on weekdays and low activity during the week. We’ve all been there. You’re waiting for your editor to send your work back to you so you can make some changes. You’re expecting an email to let you know you can start working on it. The email never arrives. The next morning, you find out that your editor sent you your assignment, but you weren’t logged into Camayak (and either didn’t have desktop notifications activated, or were away from your computer) and so you missed it. From today, anyone who’s been assigned to a step in your assignment’s workflow will receive an email 15 seconds after the assignment is sent to them (unless you choose to send it to someone else in that time), letting them know that it’s ready for them to work on. By picking someone for an empty step, you’ll make sure they get that email, too. For those of you using comments to tag people with emails that prompt them to log in, you can still do so if you’re a writer trying to notify an editor at an empty step. As an editor, you’re able to assign another editor to that empty step to ensure they receive the automatic notification. Today we’re announcing a new partnership with Getty Images, the world’s leader in visual communications, which gives Camayak users direct access to over 50 million images for non-commercial use in any of their assignments. 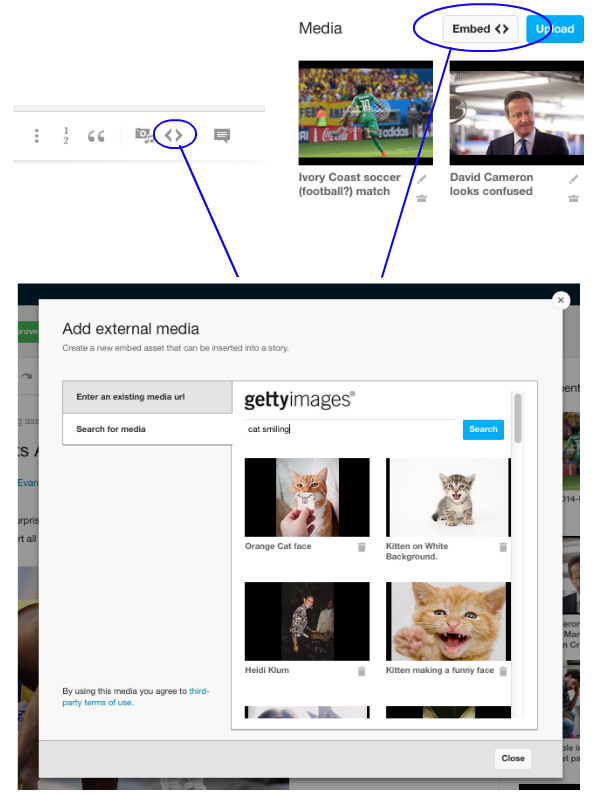 Using the embed tool, anyone working on an assignment in Camayak can now draw on Getty Images’ latest news, sports, celebrity, music and fashion coverage; immense digital photo archive; and rich conceptual images to illustrate their assignments. Whether you’re covering a news event or looking for creative images to illustrate the gist of a story, inserting high quality media into your editorial workflow has never been easier.